Successful arteriovenous fistulas (AVFs) require adequate arterial inflow. Is this the same for arteriovenous grafts (AVGs)? AVGs also need adequate arterial inflow. Arterial narrowing and calcification are relatively common in patients with chronic kidney disease, especially those with diabetes and hypertension.1 Preoperative arterial evaluation, including size and flow, is an important tool to help choose optimal inflow. When in doubt about the size of the artery for the graft anastomosis, what are the options? How small of an artery might you consider trying for a graft anastomosis? In general, preoperative arterial diameter ≥ 1.5 mm is adequate for an AVF, but one would ideally prefer ≥ 2 mm. As important as size, a soft, compliant artery is necessary for dilation and increased flow over time. A noncompliant atherosclerotic artery is not able to dilate to allow the fistula to mature over time to deliver proper inflow. A technically adept surgeon can perform an AVG anastomosis with a 2 mm artery, but again, ideally it would be ≥ 2.5 mm. The same issue in arterial quality is important when choosing an artery for the graft inflow. In addition to adequate arterial inflow, a compliant vein is needed in order to have a successful AVF. How does the quality of the vein affect the function of a vascular graft? What is the ideal size of a vein for the graft anastomosis? A venous diameter of 2.5 mm at the anastomosis in the hands of a skilled surgeon is desired for fistula or graft creation. Venous size and quality should be assessed both preoperatively and in the operating room at the time of fistula or graft creation. One not only needs to consider the quality of the vein at or near the anastomosis, but the entire outflow tract all the way to the right atrium. In addition, the size and angle of the anastomosis may be important in optimizing flow. A group from Belgium has done an elegant computerized study investigating the impact of anastomotic size and the angle of placement of the vein on flow in an AVF.2 Although these findings were in reference to an AVF, in practice, one would strive to keep the angle as acute as possible with either the vein (AVF) or graft (AVG) anastomosis. My goal is to create an anastomotic length of approximately 1.5 times the diameter of the artery. The opening in the artery, when placing a graft, should match the graft opening created by the angle fashioned, usually not as acute of an angle as previously mentioned. Without sufficient blood flow through an AVF or AVG, the hemodialysis treatment may be compromised and the fistula or graft may thrombose. How do you verify which vessels to use for fistula creation or vascular graft implantation? Evaluation of the patient for a hemodialysis fistula or graft includes the patient's medical history, a thorough physical examination, and preoperative vascular mapping with duplex ultrasound. If any uncertainty remains, we do more extensive arterial and/or venous evaluations with the help of our radiology colleagues. This is especially important for individuals who have had previous attempts at creating peripheral access or central venous manipulations. How is blood flow through the graft assessed in the operating room and during follow-up appointments? Speaking of blood flow, what is the ideal blood flow range for an AVG? A good general rule is that a graft should have at least 600 mL/min of flow to provide adequate dialysis and ongoing patency. Grafts that fall below that number have a high incidence of subsequent dysfunction or thrombosis. A similar flow is desirable in AVFs, although chronically developed fistulas may still function optimally and remain patent, even if they fall below that number. Figure 1 gives some general characteristics that result in the different scenarios. The literature states that graft thrombosis is the cause of 80% of all vascular access dysfunction in polytetrafluoroethylene (PTFE) dialysis grafts.4 Why is the graft thrombosis rate so high? First, it is important to remember that cardiovascular disease is the leading cause of death in patients undergoing hemodialysis. A history of myocardial infarction or heart failure leads to poor cardiac output, low heart rate, and low systolic blood pressure (< 100 mm Hg), which may result in insufficient blood flow, ultimately affecting AVF or AVG patency. In addition, the graft vein interface is fraught with changes in normal physiology including changes in shear stress, compliance mismatching, and perianastomotic vibration. These all contribute to changes in the venous outflow, leading to neointimal hyperplasia, which may significantly alter access flow, resulting in dysfunction or thrombosis. Figure 1. 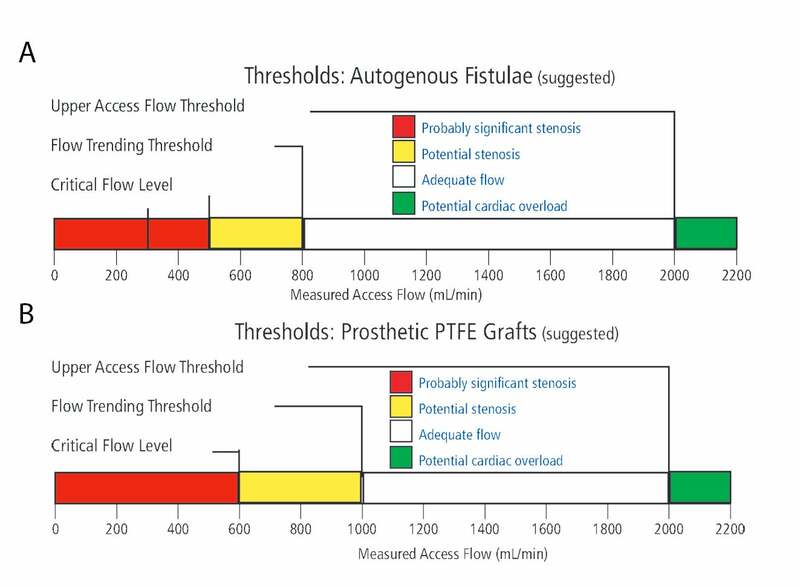 Access flow level guidelines for fistulas in adult patients (A). PTFE graft access flow level guidelines in adult patients (B). Graphics used with permission of Transonic Systems Inc. Hypertension is the single most important predictor of coronary artery disease in uremic patients, even more so than cigarette smoking and hypertriglyceridemia.5 However, even hypertensive patients can develop a systolic pressure < 100 mm Hg, which may lead to graft thrombosis. Blood pressure may be viewed as a surrogate of cardiac output. Low blood pressure may be a reflection of an abnormal pump. In addition, there are numerous causes of low blood pressure, but some that may be more likely with a hemodialysis patient include hypotension during the dialysis session or a decrease in blood volume due to dehydration. The incidence of intradialytic hypotension is the most common complication of outpatient hemodialysis; however, it is variable among centers depending on the patient, dialysis prescription, and center factors.6 Dehydration may occur due to medications such as diuretics. Hypotension can be caused by other drugs that treat hypertension, heart medications such as beta blockers, drugs for Parkinson's disease, tricyclic antidepressants, narcotics, and alcohol. Even over-the-counter drugs may cause low blood pressure when taken in combination with high blood pressure medication. Are there coagulation issues that may lead to AVF or AVG thrombosis? Hemodialysis may activate platelets by adherence to the extracorporeal circuit. Proteinuria in the nephrotic range may also increase coagulation. Abnormal physiologic states that are increased in hemodialysis patients, which activate platelets or are responsible for a thrombotic tendency, include serum fibrinogen, anticardiolipin and/ or lupus antibodies, von Willebrand factor, and factor VIII procoagulant. Historically, many studies have tried unsuccessfully to link abnormal coagulation parameters to graft thrombosis. However, O’Shea et al studied 31 patients who presented as repeat clotters and found that 90% of the patients had an elevated factor VIII level, 62% had elevated fibrinogen, and 42% had elevated C-reactive protein.7 Even so, searching for coagulation disorders can be a resource intensive and disappointing endeavor. In > 90% of thrombosed grafts the underlying pathology is venous neointimal hyperplasia at the venous anastomotic site or in the proximal vein.3 Recently, there have been reports of growing evidence of arterial inflow stenosis. What are your thoughts? We do have a reasonable understanding of the pathology and the pathogenesis of venous neointimal hyperplasia and vascular stenosis in the setting of dialysis access dysfunction.4 We also now know that chronic kidney disease promotes the development of arterial wall lesions by modifications of calcium and phosphorus metabolism, chronic inflammation, volume overload, hypertension, and dialysis stress. Khan and Vesely noted that in patients with PTFE AVGs, 28% of patients studied demonstrated significant arterial inflow abnormalities.8 When doing evaluations for graft or fistula dysfunction it is very important to study both arterial inflow and venous outflow. As we often say, the clinician needs to consider the entire vascular access circuit from the aortic valve to the right atrium. The presence of a stenotic or calcified artery may jeopardize the surgeon’s attempt to create a successful AVF or AVG and, importantly, may contribute to dysfunction of an established access. Asif A, Ravani P, Roy-Chaudhury P,et al. Vascular mapping techniques: advantages and disadvantages. J Nephrol.2007;20:299-303. Van Canneyt K, Pourchez T, Eloot S,et al. Hemodynamic impact of anastomotic size and angle inside-to-sidearteriovenous fistulae: a computer analysis. J Vasc Access. 2010;11:52-58. Roy-Chaudhury P, Kelly BS, Melhem M,et al. Vascular access in hemodialysis: issues, management, and emerging concepts. Cardiol Clin. 2005;23:249-273. Ritz E, Koch M. Morbidity and mortality due to hypertension in patients with renal failure. Am J Kidney Dis.1993;21(Supplement 2):113-118. Davenport A. Intradialytic complications during hemodialysis. Hemodial Int. 2006;10:162-167. O'Shea SI, Lawson JH, Reddan D,et al. Hypercoagulable states and antithrombotic strategies in recurrent vascular access site thrombosis. J Vasc Surg. 2003;38:541-548.